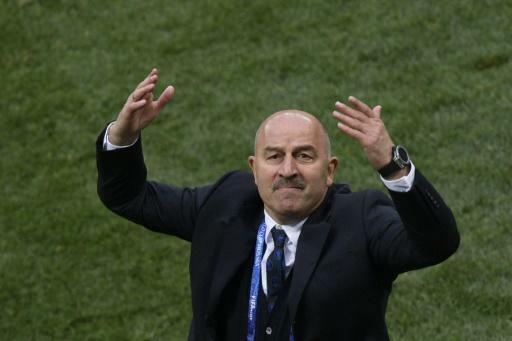 Russia coach Stanislav Cherchesov said he received a congratulatory call from President Vladimir Putin after the World Cup hosts pummelled Saudi Arabia 5-0 in the tournament's opening match on Thursday. Cherchesov's team entered the match at Moscow's 80,000-seat Luzhniki Stadium under intense pressure to put on a worthy performance. Russia were without a win in more than eight months and ranked 70th in the world -- the lowest of the 32 teams in the showpiece. "The head of state called me and congratulated me, told me to keep playing the way we were, to keep going," he told reporters. "I am relaxed. Why should I be stressed?" Cherchesov asked. "This is just the start and not the end. Just a little more and the score could have been 1-1," said the former national team goalkeeper. "Today was simply proof that we are on the right track, but we have to turn the page and look at the next game. Our opponents will be getting stronger by the match." "I could never have dreamed of anything like this," said the midfielder.